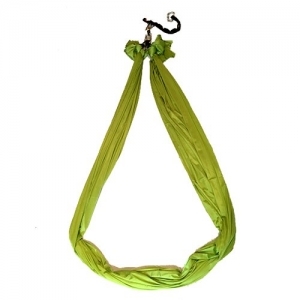 This hammock offers great versatility for any style of Yoga or Fitness. It gives a good core work-out and is popular for those who want the extra support offered by the handles. It comes fully assembled with loops for hands/feet. Includes: Special Order Tricot with Shine fabric, 2 black web loops 13”, two 24” black web multiple links, and 2 steel screw-gate carabiners. Comes assembled with 7 yards of Special Order Tricot with Shine Aerial Fabric correctly assembled to two 24” multiple links and two 13″ black sewn runners for hand or foot loops. The Hammock also has two steel screw gate carabiners to attach to ceiling point (not provided). 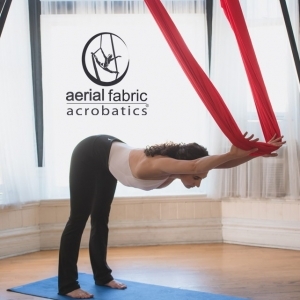 Aerial Flying Trapeze Yoga Hammock designed for a 10’ to 11’ ceiling height: Comes assembled with 10 yards of Tricot with Shine Fabric correctly assembled to two 24” multiple links and two 13″ black sewn runners for hand or foot loops. The Hammock also has two steel screw gate carabiners to attach to ceiling point (not provided). See our Answers Section for more information on fabric care. Aerial Fabric is 100% nylon tricot, tightly woven, 40 denier (thread thickness), 108 inches or 9 feet wide, stretches on the width not the length. Made in the USA, and stress tested to 2,000 pounds. Strength certificate provided upon request. Black sewn multiple links are 1″ wide, rated at 28.9 kN or 6,497 pounds of force. The multiple link is rated at 4,000 pounds of force end to end with each loop rated at 3400 pounds. Made in the USA. 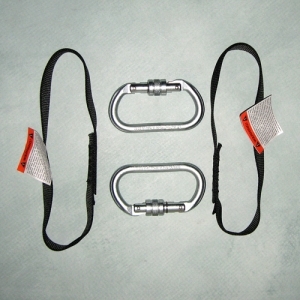 Steel screw gate carabiners are rated at 50kN or 11,240 pounds of force. Keep Turquoise and Jade out of the sunlight. Both colors fade in just one hour of sun. Wash fabric in washing machine on gentle cycle. Use a liquid soap like Woolite, and after washing, wash again with no soap just cold water to clean soap residue from fabric. Dry in dryer on medium heat. Check Runners and multiple links for any fraying. Replace if there is fraying of any type. If wrapping the multiple link around a beam, pad between the webbing and the beam to prevent fraying. Carabiners need to be kept dry. If using in salt air, check for corrosion.